When I was a kid in the 1970s, the windmills standing at the edge of Golden Gate Park were in total disrepair. They jutted up from the trees, grey & derelict. I could never tell which one windmill was which; they looked nearly identical. The only difference was that one still had its arms & one didn't. The southern most windmill is the Murphy Windmill (named after a banker called Samuel Murphy, whose generous financial contribution enabled the windmill to have been built) and the other one I grew up calling the Queen Wilhelmina Windmill. It's also just referred to as the Dutch Windmill. 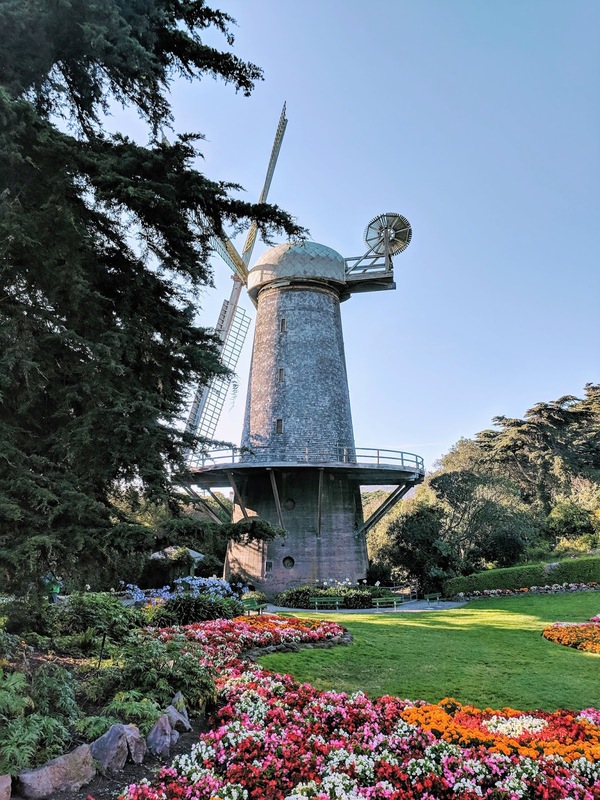 The Dutch Windmill, completed in 1903, was built to irrigate the western end of Golden Gate Park, transforming the area from sand dunes to lush park. 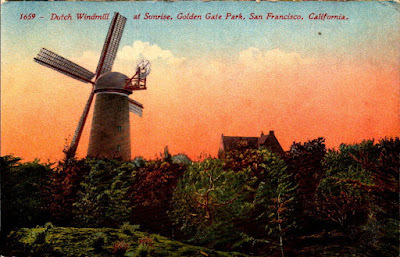 The Murphy Windmill, completed a few years later, was also used for irrigation purposes. By 1913, electric pumps took over the job of pumping water and it has been written that the windmills then began their decline. In the 1940s, much of the interior bits of both windmills were stripped to be used for the war effort and by the middle of the 20th century, the windmills had become largely decorative. I think renovations on both windmills began in 1980s and 1990s. As of today, the Murphy Windmill is fully functional. Funds ran a bit dry when it came to completely repairing its Dutch counterpart. The arms don't turn and there is some sort of insect infestation that isn't readily obvious, fortunately. I think that compared to when I was a kid, the Dutch Windmill looks lovely, if however, not entirely up to snuff. Windmills, like steam trains and sailing ships have a romance and beauty about them don't they? Yes, they truly do. I love a steam train, by the way. I was able to see steam trains running in Germany on a 'Day of the Steam Train' event some 20 years ago. It was remarkable to both see and hear them. Nice to see the Dutch windmill. Wilhelmina was queen of the Netherlands from 1898 to 1948. We have 'open-windmill-days' in the Netherlands and it's quite informative to visit them. Sometimes you're allowed to climb towards the top and walk around, nice for children as well. Many of our windmills are still functioning, not for water purposes but for grinding grain, corn, flour etc, sold in the accompanying mill-shops. I would love to visit an open-windmill-day in the Netherlands. Windmills are fantastic! Prior to this, I have always envisaged those rusting spindly water-pumps at deserted ranches on prairies when I think of windmills in the States. Too many cowboy films in my youth. Indeed! Ours in SF aren't too shabby. Being from the prairie, Tom's windmills were the norm. Now at my city house, the little city I live in has a nice one at its entrance next to the river. Don Quixote was always a favorite character of mine. Very nice! We've modern windmills stationed out toward the Central Valley. They are very modern-looking...a bit Space Age, really. I like old time county windmills, but the sight of a hillside or mountain top of the gracefully turning modern mills is mesmerizing. Yes, all windmills have a certain beauty. Considering how windmills are making a comeback for electricity generation, it's too bad that they aren't making more of an effort to get these fully restored. I bet they could still power something. I bet that they could!